Action OKR – an umbrella organisation of community groups and anyone else interested in the future of South London’s Old Kent Road – has launched a campaign to fund a dedicated space on the Old Kent Road where residents, businesses, researchers, planners, the council, developers and others can come together to debate and plan the future of this diverse corner of the city. This ‘Urban Room’ will be an independently run space (hopefully an empty shop) that will host a variety of events, including exhibitions, talks, debates, film screenings, and workshops. It will be a place anyone can drop in to view easy-to-understand models and up-to-date plans for the area, with people on hand to explain and help demystify the planning process. It will be available as an educational resource for local schools and community groups. It will also be a space for community engagement with the regeneration of the area, not just somewhere developers present plans but where the community can help advise, shape and direct them, and contribute their own expert local knowledge. Urban Room OKR is a response to current proposals for massive regeneration of the area set out in the 2017 draft Area Action Plan, from which many local people and businesses feel they have been excluded or their needs ignored. Current plans include the addition of 20,000 new homes and the extension of the Bakerloo Line, bringing huge change to this part of London, creating exciting possibilities but also causing many to worry about the effect on their homes and businesses. In order to raise the money to open and run Urban Room OKR, Action OKR has launched a fundraising campaign via Spacehive, and applied to the Mayor of London’s Crowdfunding scheme. We will present our plans to the Greater London Authority (GLA) on 25 October, and will continue to fundraise towards our target of £60,000 until the deadline of 17 December 2018. As well as financial contributions, which can be as little as £2, we also welcome in-kind support, such as offers of space, materials, services, expert knowledge, or volunteering time. More details and how to donate can be found at www.spacehive.com/urban-room-old-kent-road. 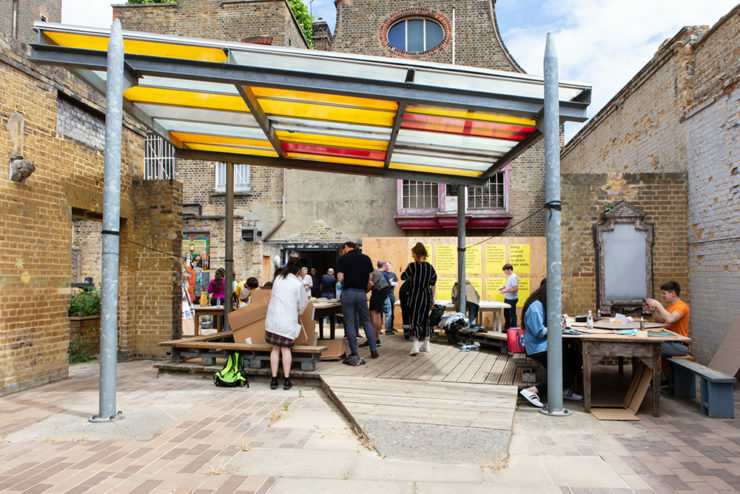 Have a look at the previous Action OKR event in June 2018 that we organised as part of the London Festival of Architecture.